- The Tigers badly miss Victor Martinez's clutch hitting: Obviously Martinez was a tremendous clutch hitter, but the player brought in to essentially replace Martinez after his off-season knee injury, Prince Fielder, has arguably been more productive. Martinez hit .330 with 12 home runs and 103 RBI in 2011. His OPS was .850. Fielder is hitting .321 and is on-pace to hit 25 home runs and drive in 105 runs. Martinez had a .394 batting average with runners in scoring position. Fielder is hitting .386 with runners in scoring position. Fielder had a stretch where he let the Tigers down badly defensively, but Martinez is strictly a DH at this stage of his career. 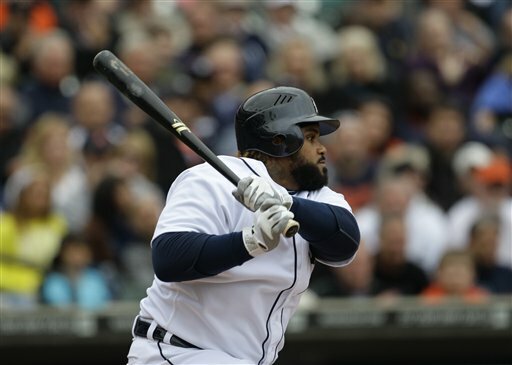 Fielder is proving to be every bit the hitter they expected when they signed him. It's a ridiculous premise to suggest the Tigers would have a better record with Miguel Cabrera at first (he led American League first baseman in errors in 2011), Brandon Inge at third and Martinez at DH than their current setup. Obviously, if Martinez returns late in the season to serve as the Tigers DH, it would provide a huge boost. He is a terrific hitter, but that isn't the point. - Quintin Berry is the answer for anything long-term other than a role as a reserve outfielder: I had a conversation with a fan after the Tigers game Thursday. He suggested the Tigers trade Brennan Boesch and make Berry their regular right fielder when Austin Jackson returns from injury. Berry, 27, has been a savior for the Tigers since Jackson went on the disabled list, but his track record as a minor leaguer strongly suggests this is just his 15 minutes of fame. His career minor league OPS is .693, just .634 at Triple-A. Boesch has a .744 OPS in the major leagues. Berry has speed and is a solid fielder, but in 15 major league at bats against left-handers, he is hitting .200 and struck out nine times. Boesch is also a left-handed hitter, but his numbers across the board against left-handed pitching are better than against right-handers in his career. It makes him much more viable as la ong-range every day player than Berry. - This is 2008 all over again and the Tigers are doomed: No, it's not. The current Tigers have a 24-27 record after 51 games. They are five games back in the American League Central race. In 2008 after 51 games, the Tigers were 21-30 and seven games back. The 2008 Tigers didn't win their 24th game until their 56th game. They didn't win their 25th game until their 61st game, when they fell 9.5 games off the AL Central lead. Simply put, the Tigers would have to go on a nine-game losing streak to be in the same shape as the 2008 Tigers after 60 games. Conversely, the Tigers were 25-26 and six games out last year after 51 games. This was after they lost the first three games of a four-game series to the Red Sox. Pat, Good article. I wonder if Vmart's leadership is missed even more than his clutch hitting. Fielder has been very good and is getting better. If you look at the numbers with runners on, VMart was lights out last year--but even he may have been unable to keep up that pace again this year. Fielder has been much better with nobody on than VMart was last year, and I think that is why people don't notice his hitting as much. Your numbers are correct, but if you look even deeper, you can see some differences. Actually, I can't wait to see this lineup with both in there, with VMart as DH!! I haven't heard anybody say Berry is a long term solution ... I think the common consensus is to ride him like a hot goalie. But he been berry berry good. And we do miss Martinez clutch hitting - hell we miss ANYBODY's clutch hitting (except Inge) - that's why we like Berry - because he's been berry berry good. And the paralells to 2008 are pretty staggering - and the numbers are not so far off - as well as you have jinxed us now for a nine game losing streak starting with Yankers this weekend - lets just all start running around screaming "Justin's got a no-hitter going in the ninth!" Not really buying the debunking ... Book ... but I love ya anyway! The two team stats that have caught my attention are the HR differential and ground into DP differential. Tigers have hit 49 HR, given up 56. So a -7 this season. They were +20 last year. This team is not built to "small ball" runs across the plate. They need to dial up the power for this lineup to succeed. Last season, Tigers turned 22 fewer DPs than they hit into. This season, it's -29. They have the most offensive DPs and the fewest defensive DPs. The DP is a rally killer that is hurting the Tigers both ways. Perhaps the switch to Santiago/Worth will help a bit. As tremendous as Jackson has been this season, Fister's injury hurts the team more.